Dissecting how the brain works is tricky. Genetic engineering techniques allow researchers to tag neurons of interest with fluorescent markers that glow upon neural activation, but capturing those brain areas in action, both as distinct neural circuits and at the resolution of single cells, can be hard. Studying the neural activity of Drosophila, for example, involves microsurgery to remove the top of a fly’s head to get a clear view of its brain, a task so delicate that only practiced technicians with steady hands are able to complete it successfully. To monitor brain activity in mice and other animals, neuroscientists often rely on a well-established technique called patch clamping, which can ignite career-questioning frustration, as electrical noise spoils seemingly good data and cells begin to die after only a few seconds of recording. “But today is an age of automation,” says MIT’s Ed Boyden. “In a lot of other fields, like genomics and synthetic biology and pharmacology, automation is at the core of success,” he says; neuroscience is no exception. In recent years, scientists have begun to design and build robotic systems to perform arduous techniques, supporting the execution of high-throughput experiments—recording from hundreds of neurons, or even dozens of animals, in real time. 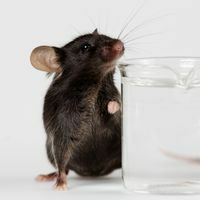 Some researchers are even developing high-throughput techniques to track neural activity in awake, and sometimes freely moving, animals. Zebrafish held in place with an adhesive gel can still move their bodies in response to various stimuli; Drosophila with their heads immobilized can still run along trackball treadmills; and specially designed microscopes can follow worms while simultaneously viewing their brain activity. “When recording neurons involved in motor circuits, the animal needs proprioceptive feedback to do the movement well,” says Aravinthan Samuel, a biophysicist and neuroscientist at Harvard University. WATCHING WORMS: To follow living C. elegans as they swim about, some scientists are using homemade “worm trackers,” such as the set up shown above from the lab of neuroscientist Catharine Rankin at the University of British Columbia. A high-speed, high-resolution camera is mounted above an agar-filled petri dish housing dozens of worms. Above is a single frame from an osmotic-avoidance assay, in which worms detect and crawl away from high concentrations of water-soluble repellents. The inset shows the positions, postures, and direction of movement of four worms visualized by the system’s software. COURTESY OF CATHARINE RANKIN AND EVAN ARDIEL Caenorhabditis elegans, a tiny nematode worm that spends its days rooting through soil and rotting fruit in search of bacterial prey, has long been a neuroscience mainstay. It has a pared-down nervous system—each worm harbors exactly 302 neurons and approximately 7,000–8,000 synapses—and all individuals of the standard lab strain have an identical, readily modifiable genetic code, giving researchers hope of “solving” the genetic underpinnings of the animal’s entire brain. Monitoring the worms’ neural activity while they roam freely to hunt food and seek mates is key, and fortunately, C. elegans are small and slow enough that microscopes can be built to track them as they move around. The first “worm-tracker” microscopes were developed in the late 1990s and were equipped with a camera mounted on a mobile stage to keep freely crawling worms in view at all times. Early versions incorporated human-controlled joysticks, whereas modern versions automate the process with worm-tracking software. In addition to keeping tabs on the worms’ whereabouts, the technology can quantify and analyze behavioral responses, such as changes in movement, direction, and velocity. These systems generally use a low-power microscope objective for tracking the whole animal, coupled with a separate high-power objective for zooming in on a particular location in a worm’s brain to observe neurons that have been genetically manipulated to fluoresce when active. Observers can see through the worm’s transparent skin, allowing researchers to record neural activity in intact, freely moving animals. Worm trackers are not yet available as an off-the-shelf tool, but researchers can build some of the dozen or so different models using instructions, software, and parts lists found online. “Compared to many things in science, they’re relatively inexpensive,” says Catharine Rankin, a neuroscientist at the University of British Columbia, who has been working with C. elegans for more than 25 years. 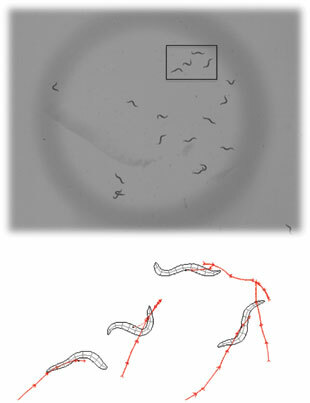 Scientists can also use worm trackers in combination with optogenetics. In worm brains engineered to express light-sensitive proteins, neurons can be activated or silenced by exposure to light of the appropriate wavelength. By systematically varying neural targets during behavioral experiments and observing the worm in the tracking environment, researchers can trace the neural circuits responsible for those behaviors. A handful of trackers are now being designed to accommodate dozens of worms at a time. Rankin, who is collaborating with neuroscientist Rex Kerr of Janelia Farm Research Campus on one such multiworm tracker, uses the device to study how C. elegans habituate to a repeated stimulus, such as the vibration from an automated tap on their plate. “In theory we thought genetically identical animals would have little behavioral variability, but that’s not the case,” Rankin says. Before the tracker, Rankin would often run 20 animals, one at a time, through several tap trials to derive a representative sample of the worms’ behavioral response, hand score the results, and then double the effort to run a set of control animals. Each experiment would take up to 40 hours, just to study a single mutant strain. Now, using several multiworm trackers running in parallel, entire treatment and control groups can be run in a single go—cutting the time required to two hours and removing the variability that would otherwise occur by running animals on different days or at different times of the day. Additionally, Rankin and Kerr can use a ring of blue LEDs to activate the sensory neurons that respond to tapping, eliminating any variability in how the stimulus penetrates the experimental environment. Rankin’s lab is also looking for the genes underlying the worms’ habituation responses and comparing the findings with human orthologs that have been linked to schizophrenia. 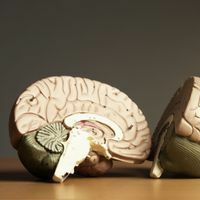 Schizophrenic patients habituate to stimuli abnormally, so genes linked to habituation responses could give clues to the genetic basis of the devastating brain disorder. What’s more, the aquatic vertebrate’s central nervous system contains more than 100,000 neurons packed into a brain half a millimeter wide—large enough to observe with the naked eye, yet small enough that the entire organ can be viewed under a microscope. “That’s the perfect size for high-resolution imaging with modern optical techniques,” says Michael Orger of Portugal’s Champalimaud Neuroscience Programme. His group is investigating the organization and functions of neural circuits that underlie visually guided behaviors in zebrafish. Among other approaches, Orger’s group uses two-photon imaging, in which red-shifted light is used to excite target neurons. Because the infrared light is minimally invasive, the approach is less likely to disturb the fish’s natural behavior than are techniques that rely on brighter, visible-light sources, and the technique “allows you really good, three-dimensional resolution,” Orger says. Using calcium indicators and two-photon imaging, he and his colleagues have directly monitored neural activity within the brains of gel-immobilized but alert and behaving zebrafish. Meanwhile, working with Janelia Farm colleague Philipp Keller and others, Ahrens has been able to image the entire larval zebrafish brain at cellular resolution using calcium indicators and light-sheet microscopy, which enables researchers to optically section and examine live tissues. From these whole-organ maps, the team has identified circuits within the brain that control, for example, how hindbrain neurons communicate with the spinal cord. As researchers continue to characterize the zebrafish brain as it relates to specific behaviors, they are coming to realize that mapping the entirety of its activities may be an attainable goal. And insights gleaned from the model fish’s brain may apply to other organisms. See full image: JPG | PDFCOURTESY OF SUPRIYO SINHA, PNAS, DOI:10.1073/PNAS.1216287110, 2013Two-photon microscopy, combined with the use of calcium indicators—the same pair of techniques now being used to visualize brain activity in zebrafish—can also illuminate the small Drosophila brain, providing a layer-by-layer view of the organ. Though the technique requires that the flies’ heads be held still, the 3- to 4-mm-long insects are awake and able to move their legs and wings. Providing the flies with small balls that move under their feet, like tiny treadmills, allows researchers to test the animals’ movements in response to various sensory stimuli. But unlike in transparent zebrafish larvae, two-photon imaging in flies requires microsurgery to remove a section of the cuticle covering the flies’ heads to expose their brains. 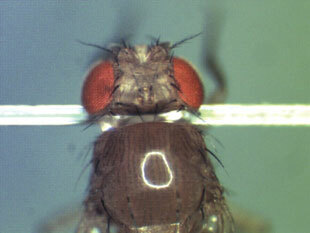 Researchers also often cut through the flies’ proboscis muscles, which have a tendency to make the brain wiggle. 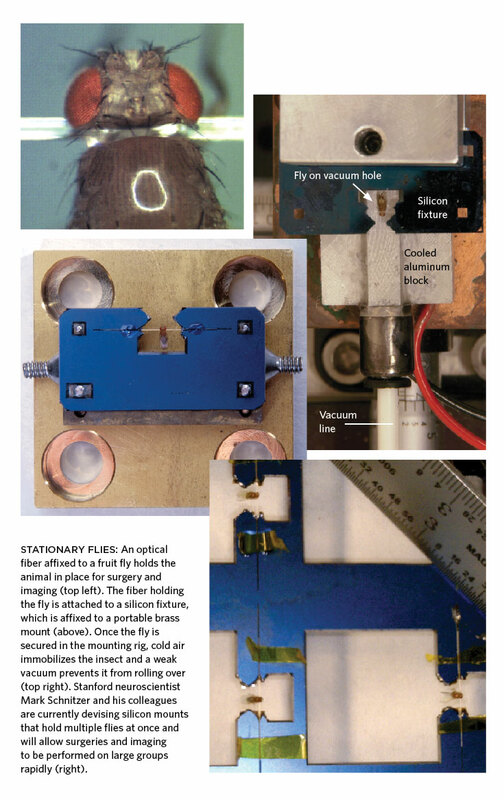 The surgery, as well as performing the imaging itself, is time-consuming work, says Mark Schnitzer, an applied physicist and neuroscientist at Stanford University, and these constraints have limited the number of flies that can be used in screens or experiments. Schnitzer and his colleagues are setting out to change that by building an apparatus that they hope will make it possible to image 96 flies at the same time. The team is also working to create equipment that will robotically pluck flies from a staging area and mount them for surgery. And the researchers recently built a system that helps researchers perform laser surgery to expose the flies’ brains and cut their proboscis muscles (PNAS, doi:10.1073/pnas.1216287110, 2013). “The dream outcome from [this] work would be that it would help tremendously accelerate efforts to understand circuit function across the whole brain, because one could pool results from experiments across many flies,” Vivek Jayaraman, a systems neuroscientist at Janelia Farm Research Campus who is not involved in the project, wrote in an e-mail to The Scientist. Researchers are already mapping the neural circuitry flies employ to detect motion from visual cues, according to Supriyo Sinha, a senior research scientist in Schnitzer’s lab, but higher-throughput imaging would enable more ambitious projects of this type. If successful, the new technology could also help detect what goes wrong in fly models of neurodegenerative diseases such as Parkinson’s and Alzheimer’s. Whereas a scientist would traditionally perform the fly microsurgery with a pair of sharp forceps under a dissection microscope, the new technique targets a small region of the fly’s head with pulses from a shallow-penetration ultraviolet laser, says Sinha. It takes less than 90 seconds to prepare a fly for imaging using the new protocol, including mounting the fly for cuticle removal, exposing the brain, and positioning the fly for imaging. The manual approach can take 15 minutes or more per fly. The laser surgeries are also more reliable and reproducible than those done with forceps by hand, Sinha notes. Furthermore, because laser surgery can yield smaller holes than manual surgery, it’s possible to image flies for 6 to 18 hours. Following manual surgery, the flies rarely live longer than 1 to 4 hours. Longer imaging times will make it possible to better study memory, learning, and neural plasticity, Sinha and colleagues say. Finally, the researchers demonstrated that laser surgery could help expose parts of ant, mouse, and C. elegans brains for imaging as well. The team wants to eventually reduce the size and cost of two-photon microscopes so they can image 96 flies at once on a single U-shaped optical table. Each fly-imaging station, when completed, will be equipped with a ball for stationary walking, an LED screen for visual stimulation, and tubes to deliver scents to the insects, Sinha says, with the option to add more customized equipment to stimulate and track the flies. The team still has extensive work to do to refine the techniques and equipment and integrate all the components of the project. “It’s still very much unrealized,” says Schnitzer. “I wouldn’t want to minimize the challenges left.” But if the project is successful, being able to do highly consistent experiments on large batches of flies will make it possible to sort out the roles of genetics and other factors that influence specific behaviors, says Sinha. “Because flies will have some degree of variability, you have to be able to test . . . many flies to essentially get a level of confidence for your hypotheses,” he says. Boyden’s team built a program that guides the instrument, dubbed the Autopatcher, through the brain of an anesthetized mouse until the pipette encounters electrical resistance. Starting in the general brain region of interest, the robot moves the pipette through a field of neurons, stopping when it senses an increase in resistance, indicating it has found a cell. 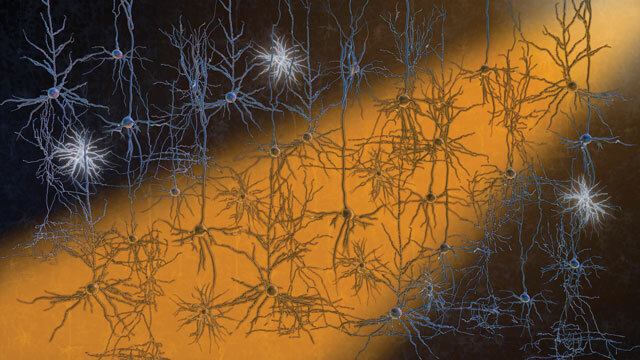 There, it applies suction and forms a patch on the surface of the neuron’s cell body. Boyden says he has in vivo recording success rates of about 50 percent, compared to the roughly 35 percent success rate of manual patching (Nat Meth, 9:585-87, 2012). “At this point we’re actually doing a bit better than a human,” he says. Though the device is not commercially available, the software for it is free to download at autopatcher.org, and the parts can be acquired for about $2,000. The primary benefit of a patch-clamping robot is that it cuts out the need to train staff in the art of electrophysiology. 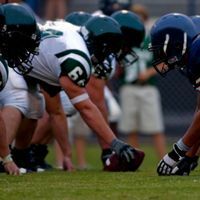 For this reason, “the results could be more consistent across individuals, and it provides the opportunity to scale it up,” says Boyden’s collaborator Hongkui Zeng, senior director of research science at the Allen Institute for Brain Science in Seattle. She is interested in characterizing cell types in the visual cortex by their morphology, gene expression profiles, and electrophysiological properties. “At the end of the day, we’d like to do thousands of cells and set up a cell-type database that will not only facilitate our own work but provide data to others in the field,” Zeng says. Another goal is to do whole-cell recordings from multiple neurons at once—which is just about impossible using manual patch-clamping techniques. Patched cells are in good shape for only about 10 minutes, and it typically takes five minutes to locate a neuron and establish the patch. But while humans must focus their efforts on finding and recording one cell at a time, the robot can make instant adjustments to multiple pipettes simultaneously. This opens up the possibility of observing networks of cells interacting at the level of individual neurons. “We can eavesdrop on [cells] as they talk to each other, or send one thing to a cell and see how it affects the next cell,” says Boyden. 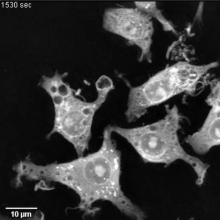 One of the main limitations of the Autopatcher is that it hunts for cells blindly, whereas human users can visualize a cell—say, one labeled with a fluorescent protein—and target it for recording. If this feature could be added to the device, it would be a big advance, says Boyden, who is hoping to do just that with MIT postdoc Alex Chubykin. For now, Chubykin works in brain slices, rather than in vivo, to design protocols for the robot to target specific cells for patching. 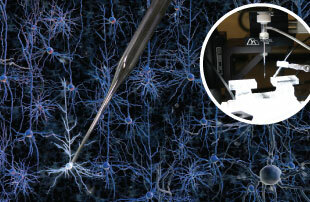 He visualizes a labeled cell within a brain slice using a fluorescence microscope and clicks on the cell as it appears on the computer screen; the robot then tracks it down and patch-clamps it. “For this semiautomatic approach, I get about 50 percent [success],” he says. 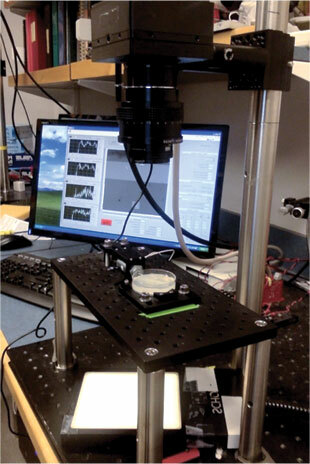 Li Zhang, an electrophysiologist at the University of Southern California who has not tried the robot, says it looks extremely appealing, and he imagines that it will expand the use of whole-cell patch clamping in neuroscience. “With the robot, it is now possible to think about a large-scale, high-throughput approach to dissecting brain circuits,” he wrote in an e-mail to The Scientist.